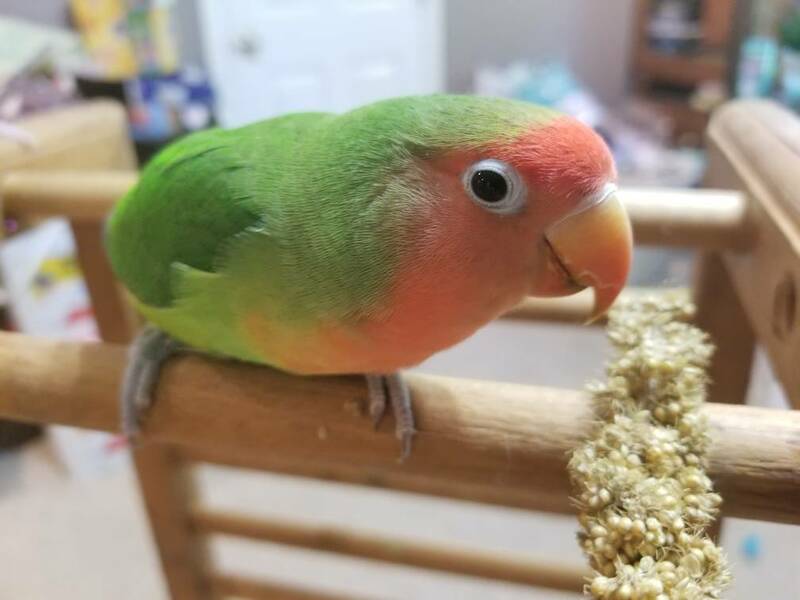 Jordan eating some millet while spending time in the livingroom, while her cage was air drying after cleaning. Nice! Setting the bar high right out the gate! I love it!!! Wow, millet and cherries, now that is playing Aces on the first cut of the deck! Its going to be a fun month! So far... a chile picnic, a millet picnic, and a cherry picnic! July is off to a great veggie/grain/fruit start! Great topic and awesome photos from everyone. Looking forward to more. PS. GalleriaGila, those are a ton of chiles! RickeyBird looks like he's in heaven. Last edited by BoomBoom; 07-01-2018 at 11:19 PM. His eyes are rolling back in his head, in rapture. Last edited by GaleriaGila; 07-01-2018 at 09:46 PM. 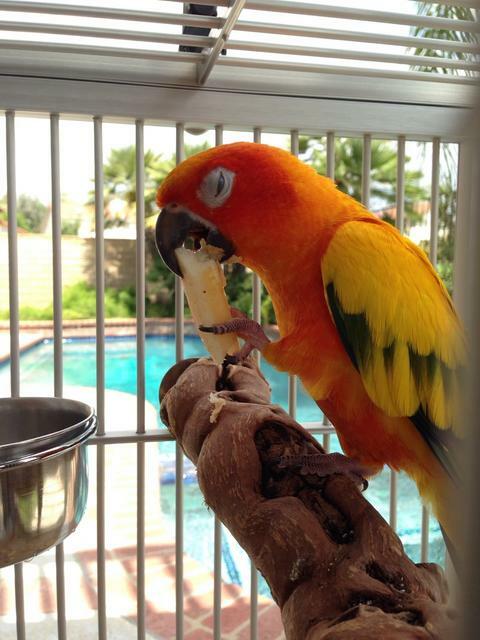 Rudy - Hybrid Ruby Macaw Born 6/6/15 Scarlet Mother/Green Wing Father - Oliver BFA RIP 3/15/15 @ 34yo. Without you, I would not have Rudy. Thank you! Should be plenty of scalywags to feast on! 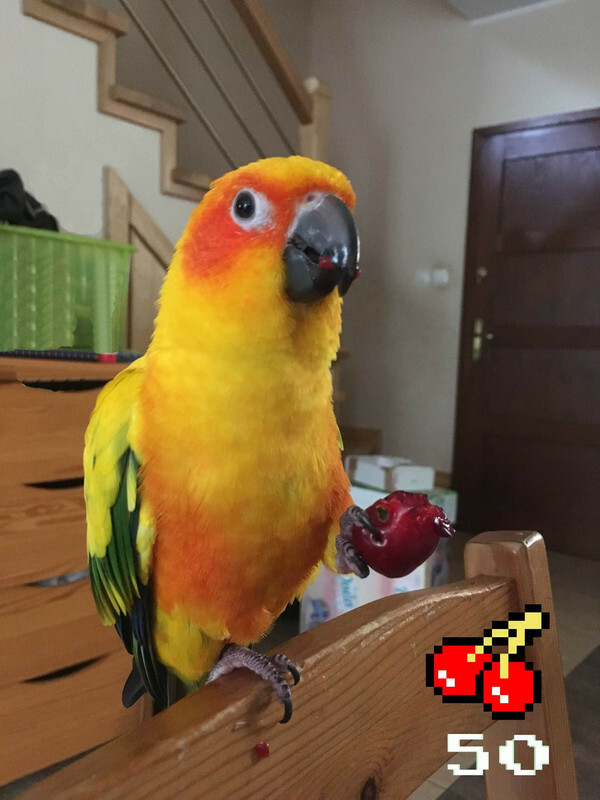 Quite the vise-grip she has on that cherry! Making sure you don't get any ill-conceived ideas about making her share. Lol! Sun conures representing hard this month with a one-two combo! I LOVE this pic and the absolute ecstasy in his half-closed eyes as he eats the apple! Bumble enjoying her chop-day picnic. Check out that spread! Bumble must be in Heaven! And there's a definite artistic flair to the food placement, like you might find in the higher end restaurants. Y'all keep it fancy over at Chez Inger, eh?